Here's why other carmakers can't copy it. In 2017, Tesla Inc. (TSLA - Get Report) took the top spot in Consumer Reports' buyer satisfaction survey. And Tesla-watchers are wondering how long the company can keep that top spot. For years, one of the biggest arguments from Tesla shorts has been that increased competition in the electric car space will pose an insurmountable challenge for Elon Musk and company. And, without a doubt, more competition is coming soon in the luxury electric vehicle space. Jaguar plans on selling its i-Pace crossover in the second half of this year, and Porsche's hotly anticipated Mission E is supposed to hit the streets next year. There's certainly something to the idea that more high-end EVs will boost the competition in the space. But anyone who focuses just on that is missing one of the biggest drivers of Tesla's success; they're not paying attention to the company's "killer app". More specifically, it's over-the-air software updates. Remember, Tesla isn't a high-tech car company. It's a tech company that happens to make cars. That's why, for instance, the very first Tesla Model S sedans that rolled off the line back in 2012 can run the newest versions of the company's operating system, with new features and an updated user interface. 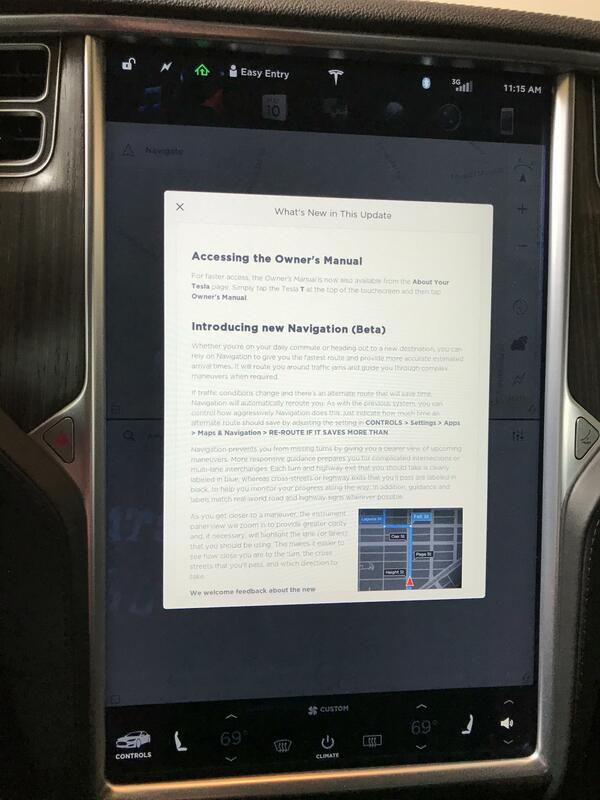 A software update detail page on a Tesla Model S.
Sit in any other 2012 model year car, and the tech will feel painfully dated. Meanwhile, the Tesla actually gets new features at no cost over the air via Wi-Fi or the car's cellular modem. That's actually a very big deal, particularly when you consider that a car is most consumers' second most expensive purchase after their home. That software update capability also means Tesla gets upsell opportunities that other carmakers don't have. For example, because the self-driving hardware on every new model is identical, Tesla has been offering 14-day trials of its Enhanced Autopilot features to customers who didn't buy that option at delivery. Of course, other carmakers are planning on introducing over-the-air updates, too. For instance, Ford and GM both say they'll include the functionality by 2020. But they will likely be hamstrung by their own dealer networks, who are likely to fight back on car manufacturers providing service directly to consumers by the way of updates. For instance, over-the-air software update capabilities equipped in some Cadillacs today are intentionally limited to maps in the car's navigation system. Free software updates are a normal thing for tech companies, but they're an alien concept for car companies (and particularly for dealers). Tesla is expected to release the hotly anticipated version 9 of its car software around the end of August.